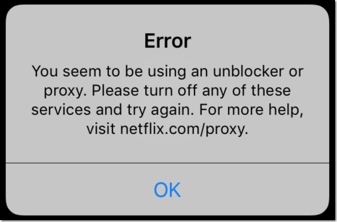 As you may have heard, Netflix started to block the usage of VPN and Proxy servers to be able to watch the USA Netflix (which has more content) from another country. Unfortunately there are still a lot of licensing issues for Netflix to allow them to have the same content at a global scale. They are aware of the problem and they are working on a solution, but this will take years. I have been testing different VPN & DNS Services that would allow you to not only protect your privacy by using a VPN to connect to the Internet, but would also work for watching USA Netflix wherever you are. In some simple words a VPN is a Virtual Private Network that will allow you to connect to the Internet through an third party server to browse the internet. 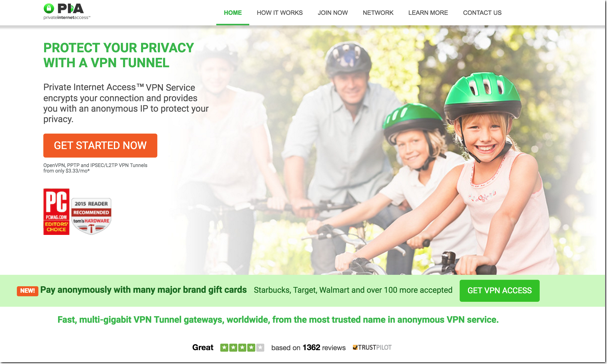 The general benefit of using a VPN is that whatever you do online will be through a another provider that usually offers complete anonymity and also encryption from your house to their servers. VPN´s are also useful when you need to access content that is only available in a specific country or region. Thats why these services allow you to for example watch USA Netflix from wherever you are. Some time ago, Netflix started to filter some providers preventing the end users behind these services to watch their content through a VPN provider, thats why on this review, we will focus on the services that do work with Netflix. The downside of using a VPN Server is that usually the connections are slower. For example in my house in Switzerland my Internet provider gives me 500 Mbps Downstream and 50 Mbps upstream, but if I would use a VPN to browse the Internet, then in most cases I wont be able to browse at higher speed than 30 or 40 Mbps downstream. What is a DNS or Smart DNS Provider? A DNS Server translates your request of a website into the real address of the server which is an IP Address. Another alternative to VPN servers is to use a SmartDNS provider, this is more simple and in general does not affect the performance of your Internet connection. The downside is that this is useful only if you need change the country from where you are browsing to the destination website, for example Netflix. These type of services do not offer any encryption and should not be used for security purposes but only to unlock content available in a particular region. 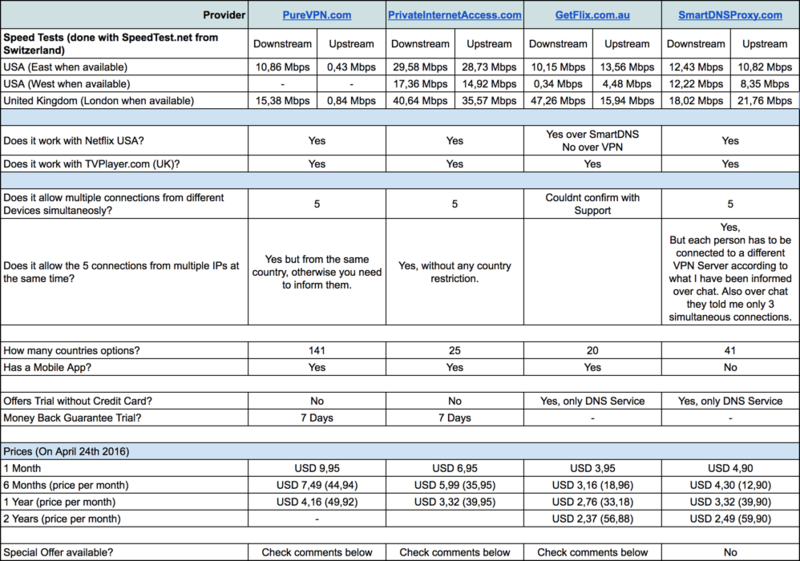 There are a lot of providers offering different VPN services. I tested several of them and the following are the ones that do work with Netflix, or at least at the time of testing. 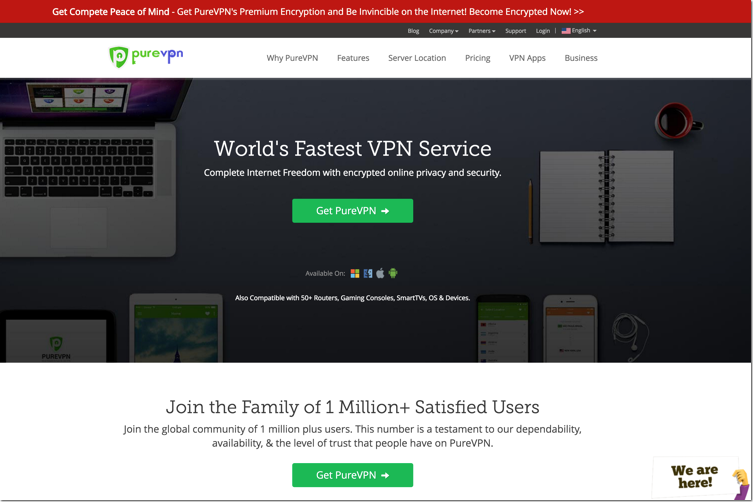 PureVPN offers a very simple interface through Windows and Mac applications among others. The service works pretty well and offers a non technical way to achieve activities, this is great for end users who are not tech savvy. Speed wise connecting to the US server was OK but not super fast, it was enough to test USA Netflix from my computer though. When I tried to do some tests with the mobile application (which looks very nice by the way) I was able to connect to the US VPN server only after several retries. Once connected unfortunately Netflix through the mobile App did not work. I did this test a couple of times and also failed. PureVPN also offers a SmartDNS add-on service (you need to pay more), but to be honest I there is very little documentation on this service and doesn’t seem to be working fine for the tests I`ve done as I was unable to register my IP address to use their service although I set the DNS manually on my MacBook Pro laptop. I contacted support over chat and they send me a link to documentation that actually was broken, chatted for more than 40 minutes and the support agent was unable to properly guide me how to register an IP address on their SmartDNS service. I pinged their support over Chat a couple of times to ask them some questions but to be honest it was slow and at some point the support agent dropped my chat session due to inactivity in one opportunity. Not cool. I like the interface and flexibility that PureVPN offers, but they need to work harder on the mobile part. If you dont need mobile, it can be a good alternative, but they need to still polish some aspects of their service. LifeTime Subscription (pay only once) for USD 99: Referral Link (Ends April 30th 2016 approx.). PIA is on the VPN business since several years, its hard not to find references to them from all over the world. I remember buying a 2 years contract with them back in December 2015. But then Netflix was not working properly. I did tests today and Netflix was working back again, so I guess that when they find out that Netflix is being blocked, they try to fix it by changing their blocked IP for another one. I pinged them to understand what is their policy when their IP gets blocked by Netflix and this is their answer over Chat support: ¨To be clear about the Netflix issue. We do not block Netflix and the service itself should have no issues on the VPN. However that being said Netflix does block our IPs and if this happens there’s nothing we can do to assist you.¨ I like that they are being straight forward. I confirmed with their chat support that you can use their service from up to 5 devices at a time no matter from which IP address they are connected. So lets imagine you have someone at your house using the service, you are travelling and 2 of your kids are also on their universities all can theoretically use the service with one single account. I must say the experience with support which I contacted several times to clarify questions for this review post was very good. I felt that the person on the other side actually understood first time what I was asking and gave me detailed links and explanations. They are in the market since quite a while, so they have a lot of experience and seem to offer a pretty solid service. They dont offer a SmartDNS service, but if you do require VPN it might be a good option to go for PIA. 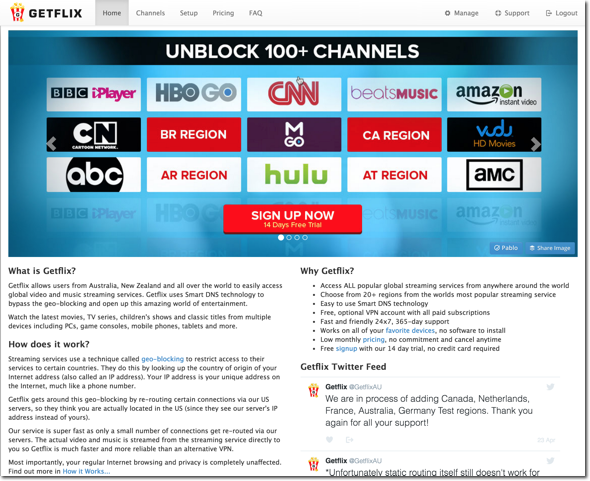 GetFlix is the sister company from Smart DNS Proxy (see below), they also primarily offer a SmartDNS Service, but also will give a VPN Service to their subscribers. I paid 1 month to be able to test and fairly compare against the other contenders too. The configuration was pretty straight forward for the DNS part. And for the VPN when I tried to configure it on my Mac, I was unable to authenticate so I couldn’t make any further tests until I reach support. They are the only ones that do not offer an online Chat support service, so I just had to wait until my ticket gets responded. Due to the time that responding to my emails took, it looks like they do not offer 24/7 support. They offer a similar service as Smart DNS Proxy does, if its not exactly the same service, because when I configured the VPN connection I was using the same server names as Smart DNS Proxy. They openly acknowledge the issues that you may face due to newest Netflix´s restrictions so they seem to be constantly working on providing workaround for the same, something good if you are focusing your usage of the SmartDNS or VPN service to watch US Netflix. GetFlix Lifetime Subscription Promo: Referral Link (ends April 28th 2016 approx). Smart DNS Proxy is the parent company of GetFlix according to what it has been confirmed to me by one of their support agents. 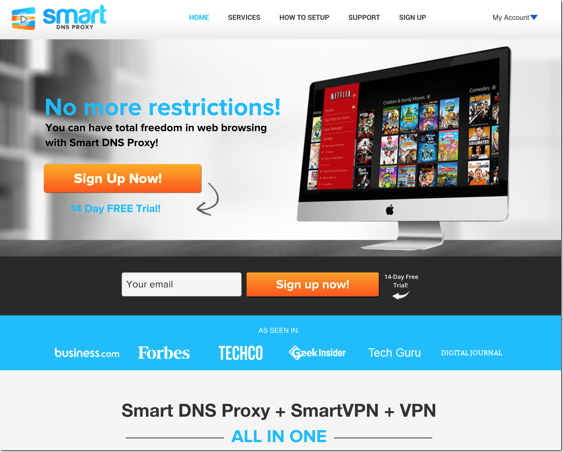 Although they are primary focused in offering SmartDNS services as their own name indicates, if you buy a subscription you can also use their VPN services. Unfortunately the VPN part cannot be enabled during the 14 days trial period. So to be fair among all the contenders I have acquired a one month account to make the same tests that you could see on the published table on this same post. I tried to configure TunnelBlick Open VPN client on my MacBook Pro but it was not possible to import the configuration files. Then I noticed that there are other methods to create a VPN directly in OSX network settings and that they were supporting so I did their tests in this way. They also support automatic updating of your own IP address through a DynDNS or NO-IP account that you can configure on your profile on their website and they would update the IPAddress every 5 minutes so you can use their SmartDNS servers without you having to worry about updating your IP manually, in case it changes frequently of course. They also offer something very nice which is connection of the VPN Service through OpenVPN for Asus and DDRWT routers which is a nice catch if you want to make your whole house traffic to go through a VPN without having to configure it on each device. Remember it has it bad side too, all your traffic speed will be restricted to your VPN connection capacity, which as you can see from the tests table I made, none of them offer really a bandwidth close to your ISP capacity. I like the idea of simplicity offered through the DNS Servers and it does work well with Netflix and TVPlayer too without affecting your ISP provided bandwidth. The price is pretty affordable too as you can see on the table. Unfortunately I couldn’t find any special offers for this service. Each service has its benefits and its disadvantages. For example PrivateInternetAccess (PIA) seems to be a great stable service for VPN, but they dont offer a DNS Service like GetFlix or SmartDNSProxy does so all your traffic goes through them, maybe making your ISP provided Internet link crawl a bit. So if your main objective to use a VPN or SmartDNS is to bypass the country or regional restriction from Netflix or others, you might be better with only a Smart DNS Solution like the last 2 options. If you need to use it on mobile, most of the tests I made actually failed. It seems the fact that there is a VPN client configured on your mobile makes the Netflix App to know you are doing this. I made a quick test by loading Netflix on a browser session and seemed to work though, so take this in consideration if you need to use on mobile from outside US. Also, there are other options like Unlocator.com, Ublock.us among others but I didn’t have the opportunity to test them. I hope you found this reviews interesting, if you do, please share them on your favourite social networks. Please leave your comment below if you want to add something or comment about another service you have tested, also if you find another offer for any of these services, I can update the post. I must say that you should add “Hide-My-IP” and HMA VPN in your list. Both of these are really effective and useful. Cost of HMA is relatively high but Hide-My-ip is offering good service in a cheap rate. Hide My IP VPN is a better deal than all the providers mentioned in the article, $2.95/mo includes VPN + Smart DNS to unblock any streaming site, up to 5 devices allowed per account. Hi BryanT88 thank for sharing this other option! You can also test ActiVPN. I use it to watch Netflix US outside US. It works perfectly !